Many youth workers have little knowledge or are misinformed about the big issues (Divorce, homosexuality, death, suicide, physical abuse, ADHD etc...) that affect ministries to teenagers. These issues are becoming more a part of the fabric of youth ministry with an ever-growing "at-risk" adolescent population. There are many books written on each of the following issues but they are designed to assist counselors and are fairly comprehensive. This series is designed to give specific critical information on the issue and to "coach" the worker through his/her role as a youth worker not a mental health professional. 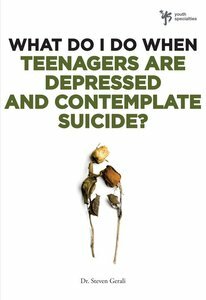 About "Teenagers Are Depressed and Contemplating Suicide? (Wdidw Series)"
Dr. Steven Gerali is a speaker, professor, and counselor who is recognized around the world as an expert in the field of adolescence and youth ministry. He's the author of Teenage Guys and two books for students. Before becoming a professor of youth ministry Steve served for more than 25 years as pastor of student ministries in churches in Arizona and Illinois. The father of two grown daughters, Steve currently lives in southern California with his wife, Jan.